Our secluded home sits on a private point of land overlooking the ocean and nearby islands. 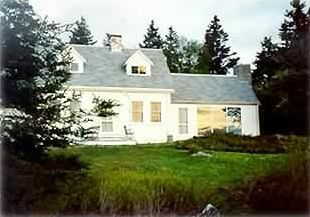 Built by our family in 1945, the house is extremely comfortable and well maintained. You will enjoy savoring sunset views from our living room after spending a day boating and soaking up the beauty of the Maine coast. This is a perfect place to relax and escape the worries of the world! The house can best be described as a contemporary Cape. As our family vacation hideaway, the house has a lot of warm, personal touches and offers all amenities. The living room wing has cathedral ceilings, a granite fireplace, and large windows overlooking the ocean. The master bedroom suite occupies another wing of the house, complete with its own private bath and a second fireplace. Another ground-floor bedroom has an adjacent full bathroom with tub. The recently renovated kitchen has a gas oven, a convection oven, a microwave, and a large refrigerator. The dining area has ocean views. Two bedrooms and a half bath are on the second floor, and an over-size water heater ensures a good supply of hot water at all times. All linens and cooking utensils are included. Professional cleaners are available on Saturdays for long-term renters. Our guests have full use of several bicycles and a small rowboat. The island boasts a number of secluded nature trails, including one just a short distance from our house that leads to nearby tidal rapids. Scores of uninhabited islands wait to be discovered, and you can watch seals frolic and eagles soar right from our front lawn. Swim in local quarries, bike the island, go hiking, or just relax in a peaceful setting. If you are looking for a peaceful spot to escape the stresses of daily life, you have found it! Our house was built by Martha Washburn deConingh right after World War II. Her son, daughter, grandchildren and great-grandchildren continue to enjoy the place for its charm, comfort, and associations. We love the island for its natural beauty, slow pace of life, and its tight-knit community. A chance to get re-connected with nature, to slow down, to enjoy the finer things in life. On a clear day, you can see all the way to the Camden Hills on the Mainland. Driveway leads from the house to a float. The kitchen was recently renovated. Window looks out to back yard and trees. The dining room table looks out towards the small adjacent islands and the sunset. Swimming in Nearby Quarries. Private Dock and Deep-Water Anchorage, Renters have use of Mountain Bikes and Sea Kayaks. Uninhabited Islands available for exploring nearby. Nature preserve (The Basin) can be explored on foot or by boat. Seal watching.